Description: Loop through finger for the grip while typing or using stylus on the move. 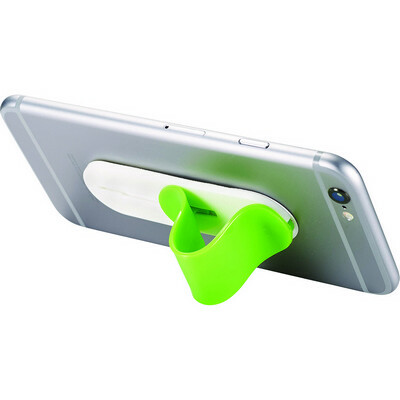 It can be used as phone stand as well. Media device not included. Features: Packaging: Bubble strips. Colour: Lime Green Material: Plastic Product Size: 80mm x 25mm x 5mm. Freight details : 1000 per carton, 8kgs, 35 x 28 x 26cms; Decoration Type(s): Colour Print. Decoration Area: 20mm x 50mm. Price includes : 1 Colour Print. Setup is included.